The 15th Blue Metropolis Montreal International Literary Festival runs April 22–28. The full program is now available on the festival website. The recipient of this year's Grand Prix is Colm Tóibín (whom I have not read, but you can be sure I'll be reading up on him now). 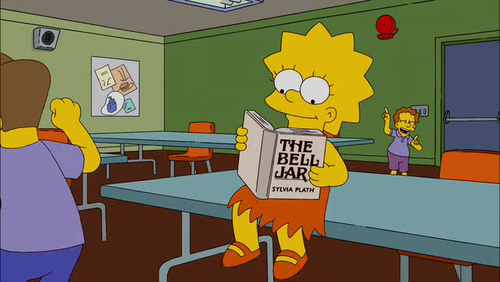 And if you're in Montreal that weekend, join me Sunday, April 28, for a breakfast salon to discuss the work of Sylvia Plath, and The Bell Jar in particular. 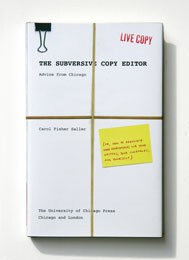 The Subversive Copy Editor, by Carol Fisher Saller, it turns out, is less a handy desk reference than it is an all-round morale booster, encouraging me in my daily grind. Yes, I am the best editor I can be, my decisions are sound, and my writers/contributors respect that. Or so I tell myself. And this book makes it a little easier to believe. What's key, in my work these days, is to leave behind the copyediting, subediting, and to think in terms of big picture editing. I'm a capital "E" Editor now. An assigning editor at a famous children's magazine told me of her exasperation after one of her staff had copyedited the same text in three revisions and kept finding errors. "Stop looking for mistakes!" she yelled. "Think like an editor and just let it go!" I believe I've discovered my new mantra: Just let it go. For reasons I won't get into just now, I'm doing some background reading on Sylvia Plath. Among other books, I ordered Johnny Panic and the Bible of Dreams, a collection of short stories, essays, and diary excerpts, and it arrived on my doorstep earlier this week. Apart from the fabulosity of that title and wishing it were the name of a punk rock band from my youth, I am loving the packaging. I picked a 1997 hardcover edition from Buccaneer Books, paying the design no mind, because it was the cheapest and most readily available option. It's grey. No dust jacket. No title embossed on the front, nor printing nor symbol of any kind. Just grey. The spine displays the usual specifics, but from most angles the book is a slab of grey. For some reason, all this grey tickles me pink. I hope this will be enough to keep me from sticking my head in the oven. If, however, you do see me slipping into a deep funk over the coming weeks, please take all my Sylvia Plath books away from me. We noticed it for the first time coming home from the airport last week, just blocks from home. "That's one lonely old man." "Helluva romantic." "Rich, either way." Un samedi au parc, tu faisais la lecture à un homme âgé. Nous lisons le même livre. 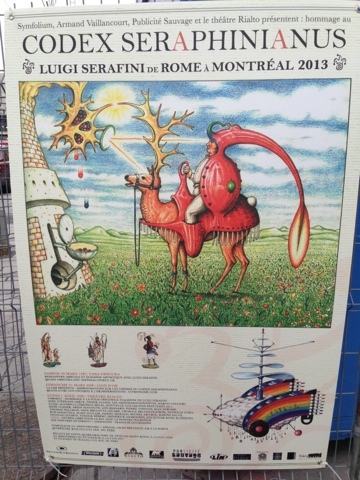 I spotted it again in Old Montreal (pictured here). It plasters the wall of the metro's central hub. One Saturday in the park, you were reading to an old man. We were reading the same book. The arrow points to a bench, clearly in Parc Lafontaine. Although, the park hasn't looked so green in many months. And we keep asking each other, can it be for real? Then why now (it's been a bit cold for sitting on park benches)? Or is it some obscure publicity stunt, the purpose of which is yet to be revealed? But publicity for what — a dress shop? reading in the park? What if we call the number? I dare you to call the number. It's a bit pervy if you think about it. Maybe he wants to bequeath his fortune to her. Or start a book club. Whatever it is, it's costing a fortune. 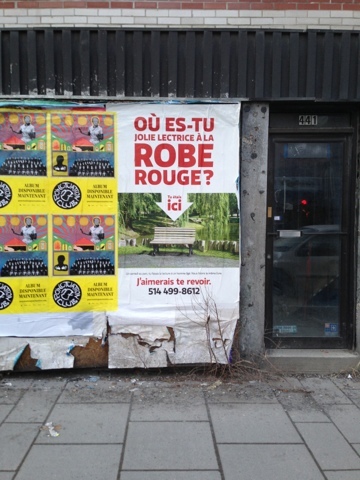 One short series of tweets testifies to poster sitings in Laval and Trois-Rivières. It has a brief newspaper mention in Sherbrooke. Apparently the man's name is William. Most mystifying to us is how little internet trace these posters have left. What seems wildly impactful on an individual level might in fact be deemed a media failure. It's as if its tracks are being deliberately swept away. We want it to be real. We want grand gestures. We believe in the potential of hopeless causes. We want it to be face value. I kind of want to be the girl in the park. But the most pressing question of all has yet gone unasked: What was she reading? Labels: advertising, love, Montreal, Où es-tu la jolie lectrice à la robe rouge? This poster caught my eye when I was downtown this weekend. 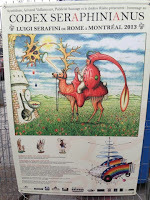 Codex Seraphinianus, by Luigi Serafini, is considered by some to be the world's weirdest book. Written in a made-up language, it is essentially unreadable, and since its publication in 1981 it has amassed a cult following. It will be payed homage, cabaret-style, at the Theatre Rialto, April 1, 2013. The event is sponsored by, among others, the Université de Foulosophie, being a play on the words "philosophy" and fou, or "mad" (in the sense of "crazy"), though I suspect there may be something foul about it too. "I am not a religious person, but if I was I would call what has happened a judgment of God. In a hundred years, maybe two hundred, it will be ours again." "Those trucks won't be gone in two hundred years." "No, but the road will be. The trucks will be standing in the middle of a field or a forest, and there will be lousewort and ladies' slipper growing where their tires used to be. They won't really be trucks anymore. They will be artifacts." "How can I be wrong?" "Because we're looking for other people," Larry said. "Now why do you thing we're doing that?" She gazed at him, troubled. "Well . . . because it's the right thing to do," she said. "People need other people. Didn't you feel that? When you were alone?" "Yes," Larry said. "If we don't have each other, we go crazy with loneliness. When we do, we go crazy with togetherness. When we get together we build miles of summer cottages and kill each other in the bars on Saturday night." He laughed. It was a cold and unhappy sound with ho humor in it at all. It hung on the deserted air for a long time. "There's no answer. It's like being stuck inside an egg." — from The Stand, by Stephen King. Came back from Cuba yesterday, and this brick of a book only half read. My first Stephen King. It's good and all, and I'm interested to see how it all unfolds, but really, I would've cut a few hundred pages. Still, all-round good and thoughtful storytelling, some nice literary allusions, too much dialogue for my taste. We'll see how the next 700 pages go. "Being stuck inside an egg." A quick Google search proves that it's not an expression original to this novel, but not exactly common. I'd never heard it before, and still can't quite pin down its meaning. Any interpretations on offer? This is the epigraph to Where Tigers Are at Home, Jean-Marie Blas de Roblès. It is taken from Goethe's Elective Affinities. The novel is about Eleazard von Wogau, a retired French correspondent in modern Brazil, editing a biography of 17th-century Jesuit scholar Athanasius Kircher. The rest of his life seems to begin unraveling — his ex-wife goes on a dangerous geological expedition to Mato Grosso; his daughter abandons school to travel with her young professor and her lesbian lover to an indigenous beach town, where the trio use drugs and form interdependent sexual relationships; and Eleazard himself starts losing his sanity, escalated by loneliness, and his work on the biography. Patterns begin to emerge from these interwoven narratives, which develop toward a mesmerizing climax. Many times when a certain longing curiosity about these strange objects has come over me, I have envied the traveller who sees such marvels in living, every-day connection with other marvels. But he, too, must have become another man. Palm-trees will not allow a man to wander among them with impunity; and doubtless his tone of thinking becomes very different in a land where elephants and tigers are at home. Where Tigers Are at Home was written in French. Originally published in 2008, it won the Prix Médicis that year. It is released in English by Other Press on March 5. I will be reading it beneath palm trees. With impunity. Seven days, one beach, 2261 pages. Packed, and ready to go. I suspect I'm being overly optimistic. It is a family vacation after all. 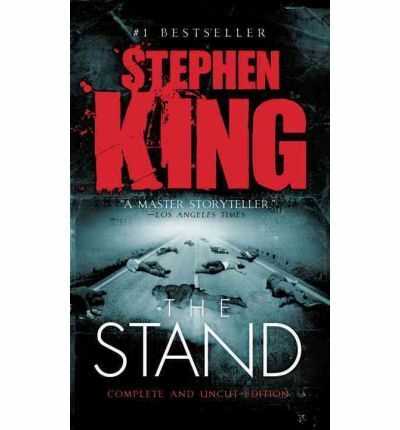 I had decided weeks ago that it was time to read The Stand. So I bought it, and I've been meaning to take it for a test drive, make sure it feels right, but I haven't really had time. 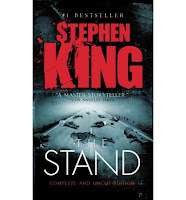 I only hope everyone's right about how good The Stand is, or I may be sitting there, on the beach, with 2261 pages and nothing to read. To Flavorwire's Books on Buildings: 20 Bookish Murals From Around the World, I would add the mural in my daughter's school playground. 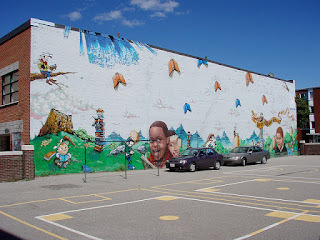 Flying books!